Gentry Boxers already qualified for the AKC Breeder of Merit program when it was introduced. We continue to adhere to these standards of knowledge. A less than optimum health screen does not necessarily rule out a dog from our breeding program unless it is potentially fatal, as with serious heart issues or Degenerative Myelopathy with two positive alleles. However, this knowledge is important in making wise choices about breeding partners, along with an understanding of the breed standard, structure and temperament. With only 17% of screened and published boxers clear for Degenerative Myelopathy, and 68% clear for thyroid issues (and the real numbers are likely much worse because many dogs are not screened and/or published), we must make difficult decisions based on a complex matrix that includes the knowledge that we gain from screening, the conformation and temperament of the dogs, and our desire to produce not only the best boxers for pets, but also for show, performance, therapy, and any other working activities that they may go into. Boxers are working dogs and must be fit to work for man. Longevity and quality of life are the results of both the breeder's choices and raising of puppies, but the natural and ongoing care and training of the owner. stock as recommended by the Parent Club. These screens above are the minimums required to maintain Breeder of Merit status. 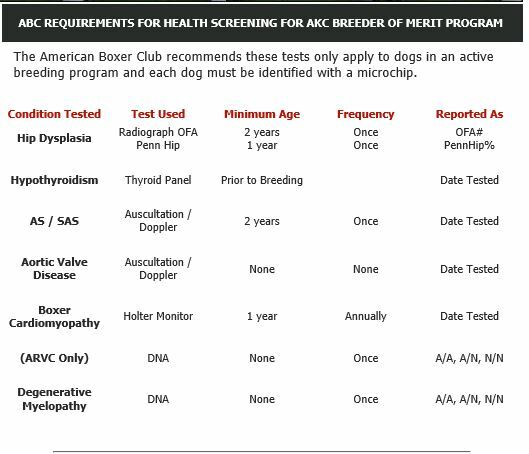 They are requirements and not recommendations, as confirmed by the AKC Breeder of Merit Program Director. In addition, I also screen for elbow dysplasia, plus run routine and periodic screens for inherited eye conditions and thyroid.